My boys love superheroes of all kinds. So when a big box arrived, thanks to MomSelect and Mattel, they were excited to find tons of Batman goodies inside. Before throwing a party with the gear, I let the boys each pick out a few items that they liked the best. 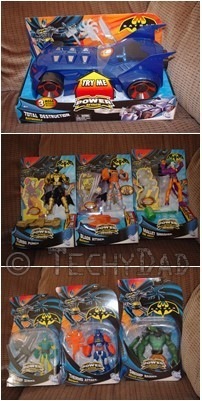 JSL chose a Power Attack Deluxe Turbo Punch Batman figure. This Batman has a battering ram-like weapon that attaches to his arm. When you squeeze his legs, Batman’s torso swivels and it hits its target. (Speaking of targets, it comes with a cardboard Joker target to knock down.) JSL also selected a Power Attack Robin with a shield. 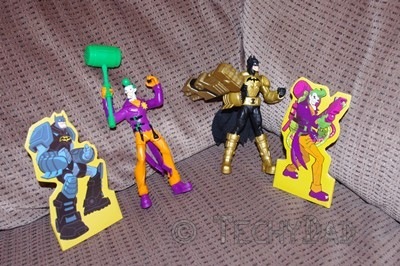 NHL chose a Power Attack Killer Croc and Power Attack Deluxe Mallet Smasher Joker. As the name implies, this Joker holds a mallet high above his head and smashes it down (perhaps at the included cardboard Batman target) when you squeeze his legs. 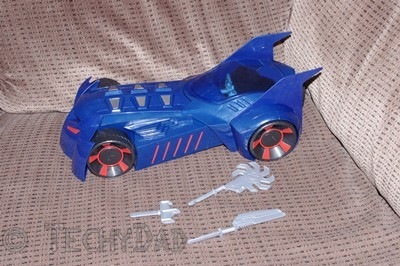 Also included was a Batmobile car that could hold one of the non-deluxe figures (such as Robin) and fire various missiles. As soon as I opened the toys for them, they would disappear from my hands and rapidly enter playtime. The boys had a blast putting together scenarios where Batman and Robin were facing down Killer Croc and the Joker. Robin would often enter the Batmobile and fire missiles at the villains. Given that it was close to Thanksgiving, we had our party in two parts. First, we met Becca Marsh and her family for a quick dinner out. Becca has three boys and a girl. I made sure to include a Batman toy for her daughter as well. After all, Batman is not just for boys. The kids had fun talking and playing in the restaurant together (and the adults had a good time talking to other adults). They all loved the Batman toys and were excited when I laid them out on the table for them to choose their favorites. For the second part of the party, we took advantage of some family coming into town post-Thanksgiving. Uncle I, Aunt M, and Cousins S & B were staying at Nana and Papa’s house so we went over one morning with a ton of Batman goodies. 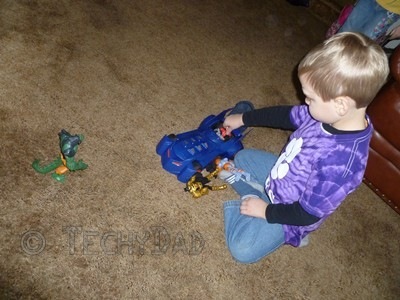 This time, since the kids would have more room to play, I had my boys bring the Batman toys they picked out initially. Cousin S and Cousin B were excited about their toys and played Batman with the boys for awhile. On one floor, there were both boys and girls aged from 2 to 9 years old, all enjoying Batman. (Up to age 37 if you count me playing along when I wasn’t taking photos.) Proof that Batman’s appeal spans a wide range of ages. Disclaimer: I received a selection of Batman toys, gift bags, a Batman Brave and the Bold DVD, and various party supplies from MomSelect and Mattel to facilitate my Batman Party. The opinions expressed above, however, are my own.